I am a research scientist and consultant whose motto is “Creating health from the soil up!” Due to health problems in myself and in my family when I was growing up, I became interested in nutrition and decided to get a university degree in that area while also studying many aspects of holistic health and nutrition concurrently. With my degree under my belt, I started my career in the field of nutrition working with various holistic-minded doctors. However, after a while, I came to realize that our foods are not the quality they could be or should be, especially when considering nutrient density. Significant drops in nutrient density, as much as 70%, over the last 70 years have been verified through several scientific studies examining food nutrient databases compiled through the years. In an attempt to obtain the best nutrition, many people reach for certified organic foods. Unfortunately, scientific research studies show that organically-grown foods have little more nutrient density than those conventionally-grown. I also came to realize that nutritional supplementation was not the complete answer either. Isolated nutrients cannot compare to fresh foods which contain thousands of active enzymes and healthful phytochemicals, whose benefits have yet to be fully elucidated. Human health starts in the soil. Healthy, nutrient-balanced soil can yield healthy plants which are highly nutritious for animal and human consumers. Optimally-grown foods have a wider array of phytochemicals and significantly greater amounts of nutrients which are known to be important for health than foods of the same varieties grown on typical, imbalanced soils. 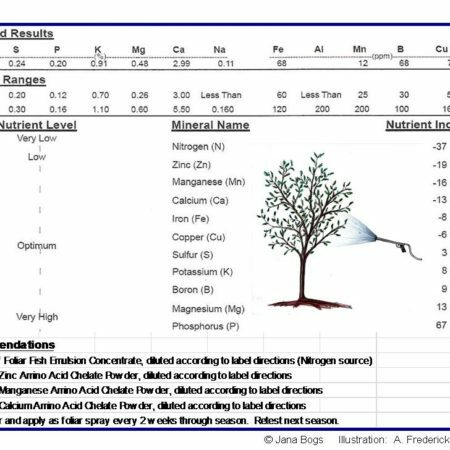 Furthermore, foods grown in imbalanced soils may contain high levels of anti-nutritional components such as nitrites and nitrates, and possibly even toxic heavy metals. 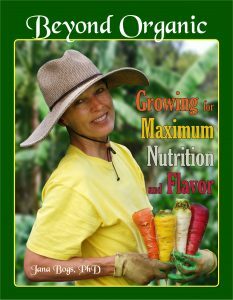 Coming to this understanding, I felt compelled to learn more about ideal soil and how to grow the best nutritional quality foods possible for maximizing health benefits. Therefore I pursued a PhD in horticulture and food science, and continued to learn from the few people around the world who focus on food nutrient density. I had concerns about toxic chemicals used in food production, not only for the health of consumers, but also for the environment. Therefore, this nutrient-dense food must be grown in a non-toxic, sustainable manner. Healthy soil has balanced, optimized chemistry and high levels of active beneficial micro- and macro-organisms. The soil chemistry and biota work synergistically to stabilize the soil, improving water-holding capacity, and decreasing nutrient leaching and erosion. Fortunately, healthy plants are also more resistant to pests and diseases, have higher yields, better flavor and longer shelf life. These aspects bode well for consumers, producers and marketers, decreasing losses and improving profitability. 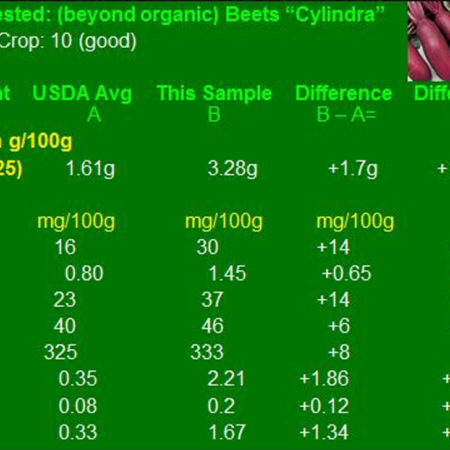 My research compares various cultivation systems examining multiple parameters in soil, leaf tissue, and fruit/vegetable. Now we can grow foods with double the nutrient density. My research also extends to human sensory perception and blood glycemic response. It literally extends from the farm soil to the dining table, and beyond. In the end, it is the consumers’ health that is at stake. The USA is experiencing an alarming rise in the rate of type 2 diabetes. This is absolutely related to the foods currently consumed. I believe that the way food is produced can have a huge impact. For example, field observations and pilot data suggest that human blood glucose responses differ between fruits of the same cultivar grown under these different methods. It is reported that diabetics can eat high quality, biologically-produced fruit without a large glycemic fluctuation, yet the same cultivar conventionally grown causes a spike in blood glucose. What makes these observations even more intriguing is that the biologically-produced fruits typically have a higher percentage of sugars than the conventional counterparts. In addition, the biologically-produced fruits are reported to taste better and have a much longer shelf life. This is the absolute cutting edge of nutrition research. To my knowledge, there is no one else doing this type of research in the entire world. The leading causes of death are cardiovascular disease, cancer, and stroke. All of these diseases are greatly influenced by nutrition, as you probably well know. People need and deserve full-spectrum nutrient-dense foods which support their health. I work to bring this “beyond organic” food to the world through helping farmers, gardeners and food companies understand how to produce this supreme quality food. Research continues on growing methods, food attributes and health effects. Production and marketing are being ramped up to supply a larger number of people with these superior quality foods. Whether you are a farmer or a food product company, bringing these “beyond organic” foods to the marketplace is a wonderful service to humanity. It also possesses the potential for great financial reward. Working together, great things can be achieved. Lots of seminars, conferences, courses, books, mentors, and hands-on research in the fields of holistic health and sustainable, organic eco-agriculture.